Virginia Tech’s Marion duPont Scott Equine Medical Center has reopened to outpatients March 30, following the Virginia Department of Agriculture and Consumer Services’ issuance of an official release of quarantine March 28. The hospital is scheduled to resume full operations, including inpatient and emergency care, April 2. The quarantine was imposed by the Virginia State Veterinarian’s Office on Feb. 20 in response to the suspected infection of two horses with equine herpes virus type-1 (EHV-1). Eighteen patients were held at the hospital during the restriction. Three of those hospitalized horses tested positive for EHV-1 – two of which have since tested negative for the disease and remain in the center’s Animal Biosafety Level 2 isolation unit and one of which was euthanized due to unrelated medical conditions. No horses died at the center from EHV-1. 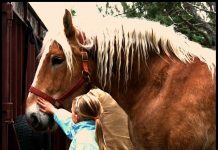 According to Dr. Nat White, professor at Jean Ellen Shehan and Director of the Marion duPont Scott Equine Medical Center, the state veterinarian authorized the release from quarantine based on stringent criteria established by the hospital’s leadership, including the isolation of groups of horses, the length of time for which the horses have shown no symptoms and a rigorous testing protocol. “The center’s facilities have been thoroughly cleaned and disinfected to ensure the safety and well-being of our patients and we are ready to once again provide the highest quality of care and service to the equine community,” White says. The university teaching hospital environment proved integral in containing this infection, notes Dr. Martin Furr, Adelaide C. Riggs Chair in Equine Medicine. According to Furr, new criterion have been added to the center’s biosecurity guidelines as a result of the infection, including the mandatory use of hand disinfectants and restrictions on visitor access to hospital facilities. An opening day informational meeting featuring presentations by the center’s internal medicine specialists will be held from 2:30 to 3:30 pm March 30 in the hospital’s library. Clients and referring veterinarians who are interested in learning more about EHV-1 prevention and general biosecurity are encouraged to attend. Clients with questions concerning the reopening can call the center’s toll-free hotline at 866-438-7235. The Marion duPont Scott Equine Medical Center is a Leesburg, Va., based full-service equine hospital that is owned by Virginia Tech and operated as one of three campuses that comprise the Virginia-Maryland Regional College of Veterinary Medicine. 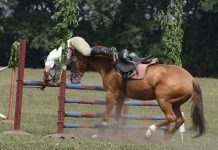 For more information on the Marion duPont Scott Equine Medical Center, visit www.equinemedicalcenter.net. That must be a relief for all clients in the area! Thanks for reporting consistently on the status of EHV-1 in the US — we ALL need to know this.